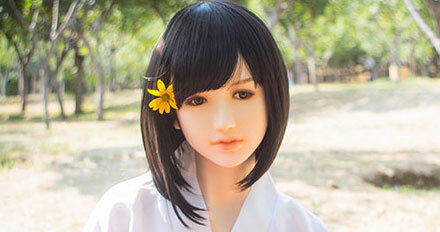 Helen is a life-sized female head by Doll Sweet. Helen's mouth is closed and has neither teeth nor a tongue. The head is made of silicone. Helen is as well available in standard makeup as in S-level makeup. Helen fits best to silicone doll bodies from 158 cm and up. This head fits to the following body styles. More information about individual customizations for this head. To start the video please click in the middle of the preview image. Displaying 1 - 9 of 9 matching bodies. For more information about a specific body, simply click on the picture. Displaying 1 - 4 of 4 matching heads. For more information on specific eyes please click on the picture. For more information about a specific wig, simply click on the respective image. Displaying 1 - 4 of 6 compatible wigs. Displaying 1 - 4 of 4 related image galleries. To get to a picture gallery, simply click on the picture. For more information on a specific accessory product, please click on the respective image. Displaying 1 - 2 of 2 compatible accessory products.